This Friday, the Boyle Heights Historical Society will be hosting a talk and book-signing by Catherine López Kurland regarding her book, Hotel Mariachi: Urban Space and Cultural Heritage in Los Angeles, which was co-written by Enrique R. Lamadrid with photographs by Miguel A. Gandert and an introductory essay by Evangeline Ordaz-Molina and published by The University of New Mexico Press in 2013. Kurland is a descendant of the López family, which settled the area known as Paredon Blanco in the 1830s and which became Boyle Heights several decades later. Her maternal grandmother, Sacramenta Lopez, married George Cummings and the couple built, in 1889, and operated the Cummings Block and Hotel at 1st Street and Boyle Avenue—the property has recently been known as “Hotel Mariachi” as well as the Boyle Hotel and has undergone an extensive renovation. Kurland first saw the building a little over a decade ago and it spurred her to research and write about the building and help in its preservation as a valued community space for Boyle Heights’ mariachi musicians. So, here's an early photo of the Cummings Block, probably taken just after its completion 125 years ago. 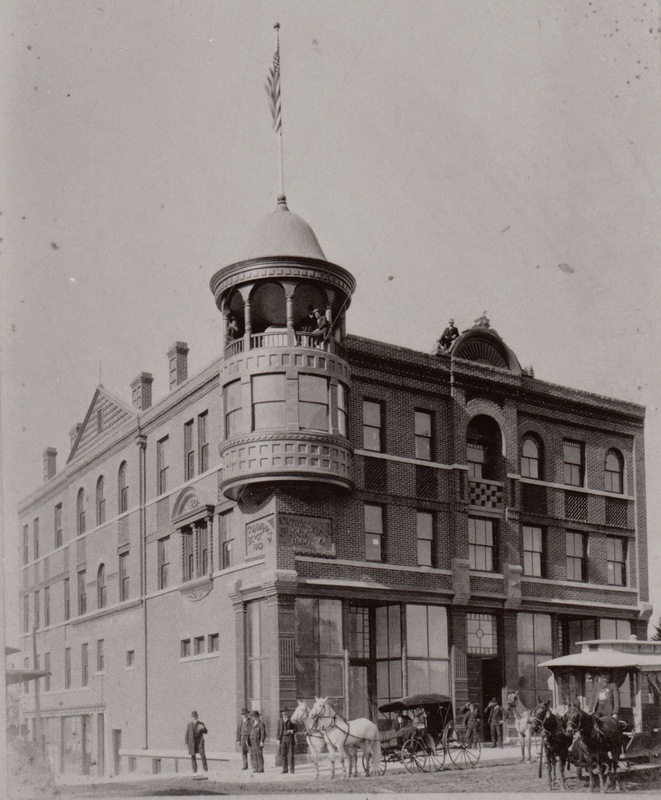 A circa 1889 photograph of the newly-completed Cummings Block at the northwest corner of 1st Street and Boyle Avenue, Boyle Heights. This is a copy of an original owned by the Hon. David A. Workman, grandson of Boyle Heights founder William H. Workman. Click on the image to see it enlarged in a new window. George Cummings hailed from the Empire of Austria and emigrated to the United States in time for the famed Gold Rush. Working with a companion he met on the ship over from Europe, Cummings made some quick cash on his first foray in Tuolumne County, but a second effort in Mariposa County proved to be a failure. He and his partner spent three years farming along the Merced River and, from 1853-58, engaged in cattle ranching. In 1858, Cummings purchased the Tehachapi ranch of over 3,000 acres, though two years later in the federal census he was counted among the residents of Los Angeles. He later bought a section of 160 acres at Alpine Station in what is now Palmdale. In 1869, Cummings married Maria del Sacramento López, daughter of Francisco López, whose father Esteban, obtained the area known as Paredon Blanco (White Bluffs) from Los Angeles pueblo authorities (more on the Lopez family can be found here.) The couple first resided on the ranch at Tehachapi, where they appeared in the 1870 census, before relocating to the Lopez homestead, south of First Street and west of Boyle Avenue, mainly in the flats adjoining the river. In 1876, just as Boyle Heights was getting its start, the couple built a $4,000 home on a 40-acre parcel in the Mount Pleasant Tract. There, the pair had 2,000 orange trees and 1,500 deciduous fruit trees, among other improvements. George died in 1903 in Bakersfield and Sacramento lived until 1930. The couple had five sons and two daughters. As for the Cummings Block, the four-story brick structure was designed in the Queen Anne and Italianate styles by architect W.R. Norton and cost $22,000 to build, according to a Los Angeles Times summary of buildings completed during 1889. It featured cast-iron columns along the first floor storefront, patterned bricks for decorative panache, and a distinctive turret at the corner. Originally, the building housed the Cummings Hotel (later the Mount Pleasant--the name of the nearby subdivision created by Cummings), comprised of several dozen rooms, and which was geared towards the tourist trade. The building of the structure was timed along with the completion of the Los Angeles Cable Railway, which utilized a viaduct along First Street to cross the Los Angeles River, traverse the "flats" on the east side of the river, and then climb the "paredon blanco." Notably, 1889 also saw the completion of the Orphans' Asylum in south Boyle Heights as well as the Los Angeles County Courthouse and Los Angeles City Hall--all reflecting the tremendous land and population boom that engulfed the region after the 1885 completion of a direct transcontinental railroad line to Los Angeles. The boom, however, soon went bust. Still, the building survived as a hotel and then as a residential building, with such retail uses as a drugstore, dental office, laundry, music school and others. Declared Los Angeles Historic-Cultural Monument #891 in 2007, the building underwent a major renovation and upon completion of 2012 opened with 51 affordable housing units and three ground-floor commercial spaces, including a mariachi cultural center to tie-in to the structure's recent history as a residential space for musicians of that genre. Concerning the Cummings Block's architect, William Robert Norton was born in Massachusetts in 1853. Afflicted with tuberculolsis, Norton went west and practiced architecture in Los Angeles from about 1874, when he designed an adobe house for the president of the Riverside Land and Irrigating Company, to 1890 and then relocated to the Territory of Arizona. Established in Phoenix, he designed schools, courthouses and private homes in that city, as well as in Globe, Prescott and other towns. Norton also created the subdivision of Sunnyslope, now in the northeast part of the City of Phoenix. His 1895 residence, badly damaged, still stands, partially rebuilt in a decaying part of Phoenix. Norton died at age 87 in 1938.